For the first step, I tackled the sides of the canvas. I thought it would be tricky to wrap and Mod Podge the paper around the edges of the canvas. Instead, I decided paint the edges and picked a color (Folk Art Basil Green) that complimented the papers. Step two was to cut out two 2” x 2” squares for each of the eight pieces of scrapbook paper. Once they were all cut out, I played with the arrangement and found a pattern that I liked. Next, I taped together four squares at a time to form strips of the paper. I then taped the four strips together to connect all of the ‘patches’. With the papers taped together, I was ready to Mod Podge! I find that giving the paper (or fabric) a top coat of Mod Podge before adhering it to a surface makes the paper easier to work with. It does not take long to apply the Mod Podge – a few minutes – but always be sure to allow for ample drying time – about 1 hour. Adding coats of Mod Podge to a surface that is not completely dry can lead to a finished product that feels sticky. Once my top coat was dry, I was ready to adhere the paper to the canvas. I applied a layer of Mod Podge to the canvas and a layer to the back of the paper. For the next step, it is important to work quickly. I placed the paper on the canvas and worked to smooth out the paper. I used my hands and a drug store rewards card I had on hand to smooth any bubbles and wrinkles out of the paper. After smoothing out the wrinkles, the sign was ready for a top coat of Mod Podge. When the first top coat was completely dry, I put the stickers in place and then added two more coats of Mod Podge (allowing each coat to fully dry). The last step was to staple the ribbon to the back of the canvas, tie it in a bow, and hang it on the door! What fall projects have you been working on? Today, I am excited to have a guest post from the very talented Heidi from Saffron Marigold! Heidi Muller is an enthusiast for all things creative. A mom by day and artist by night, she currently blogs for Saffron Marigold - a boutique maker of high quality, hand printed Indian textiles. She delights in unique, eclectic decor that is eye-catching and not bank-breaking. Heidi found my blog when I posted the Cous Cous inspired bedroom, and we have become blog pen pals since then. Heidi and I share a love of beautiful textiles, colors, and DIY projects. I am so happy to have her with us! Hi everyone! My name is Heidi, and I am visiting today from Saffron Marigold. 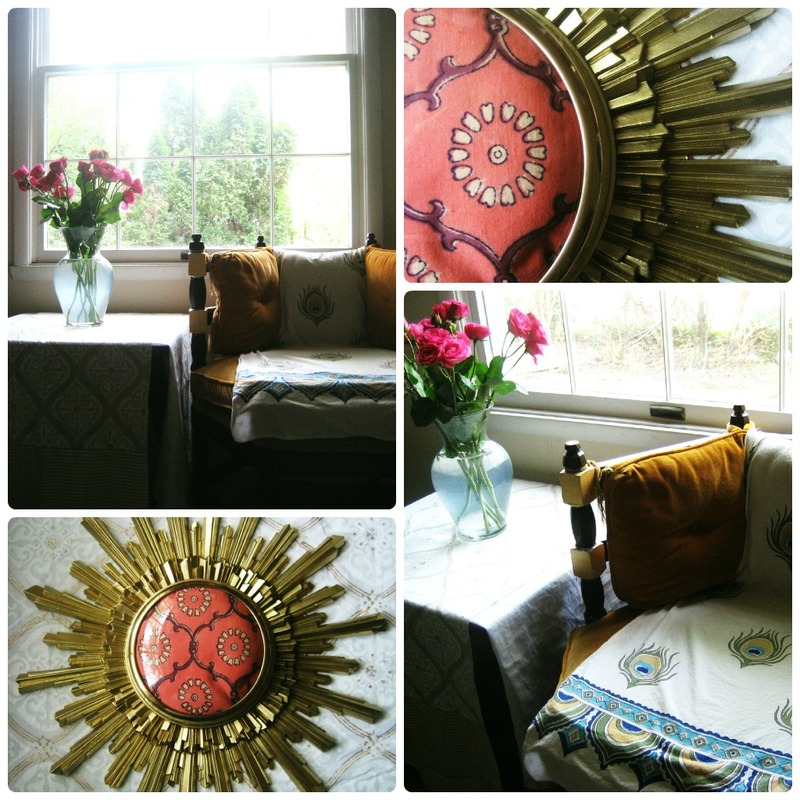 I'm so honored that I have the opportunity to guest blog on Cathy Green Interiors! Cathy has a wealth of (amazing!) DIY inspiration that she shares with you regularly, so I thought I'd join in the fun with a bit of my own. I LOVE textiles- I find that they add instant color, texture, warmth and personality to my space. I have 5 (yes, 5 :)) kids, so fun, functional, simple and thrifty decor is a must. I have always loved a good "find", and tag sales, thrift stores and antique shops are favorite resources. This room is convergence of inherited antiques, Craig's List finds and DIY art. Interestingly, they all hang together as independent blocks of color - primarily purple, red, yellow and green. As long as colors are equally bold, and are given equitable visual space, they will all play together nicely. Painted Chargers - I found a set of bamboo chargers at Target several years back. They have a wonderful natural texture, were quite solid and perfectly priced - $6 for all! The chargers did, however, beg to be painted. The bamboo surface responded beautifully to several layers of rubbed acrylic paints. (Somehow, I didn't notice that these were "stop light" colors until I hung the pieces in a column!) I do love to hang pieces in groups...same-size/shape objects create wonderful graphic impact. My small office is part library, part art studio, and part "blogger work space". Ultimately, it needs to work hard, but be very welcoming and inspiring. (You know us creative types - we have to be inspired! :)) So while this room contains a desk, book shelves and art-supply storage, I'm sharing my favorite part with you - a cozy window seating space where I plop down with a book or laptop to read and work. As a Saffron Marigold blogger, I have at my disposal 30 or so gorgeous, global, hand-printed cotton swatches which I keep on hand in my office. I love to move them around and use these large pieces in my decor, changing them seasonally or as the mood strikes. In this scenario, I am using elegant Vanilla Glacé atop a sweet little mid-century table (with a rotating top) which I found at the thrift store. Over another unique thrifty find, dubbed "the princess chair" by my kids, I have draped one of my favorite prints: Dance O Peacock. I can't believe what a perfect match the gold-ochre is for the gold velvet in the chair! Finally, India Rose is embellishing one of my favorite objects, an original sunburst clock frame which I literally found in a closet when we moved into our home. I removed the clock face from the piece and have replaced it with a bit of fabric. I like the result - part opulent, part eclectic and perfectly inspiring. What special finds (thrifty or otherwise) have inspired design in your home? How have you used fabric to change the feel of a room? Have you used it in any "non-traditional" ways? What colors are you drawn to again and again? Do you use different palettes to evoke different moods? If you have a minute, share your thoughts in the comments! I know both Cathy and I would love to hear from you. Thanks so much Heidi for sharing your ideas and inspiration with us! I needed a filing cabinet for my office and found this silver one at Staples. It was feeling a little too boring for me though, so I decided to spruce it up. The first step of the project was to spray paint the filing cabinet. I used Rust-Oleum’s metal primer, and Valspar’s ‘Purple Fury’. Before I began painting though, I wanted to block the four holes for the handles so that spray paint would not clog the holes or get inside of the filing cabinet. To do this, I rolled up a small piece of aluminum foil and placed one inside each hole. I also taped over the lock to protect that as well. Once I was done painting the filing cabinet, I thought long and hard if I should do a next step, and if so, what would the next step be? Should I leave it alone, stencil it, or Mod Podge it? I felt that the plain purple was a little too plain for me, and I was still recovering from our dining room stencil project ;), so I decided that Mod Podging (a glue and sealer in one product) was the way to go. I already had this fabric that I originally bought a few months ago to make a runner for our dining room, but with the new color scheme it no longer coordinates with the room. It was, however, perfect for this project. To start the Mod Podging process, I measured the drawers and found a piece of paper to use as a template that was almost the same size as the drawers. I picked the two flowers I liked the best and used the paper as a guide to cut around them. The drawers on the filing cabinet are 13” x 10 ½”, and I knew I would need at least an inch of extra fabric to wrap around the drawers. I cut the fabric about 18” x 15” just to be sure I would have enough. Once the squares were cut, it was time to start Mod Podging. Since I’ve only done one other Mod Podge project (here), I checked out a few websites for tips and tutorials. I found these two sites to be the most helpful: Mod Podge Rocks & Cottage at the Crossroads. My first step was to paint a thin and even layer of Mod Podge onto the fabric. Once that layer of Mod Podge was completely dry, I was ready to apply it to the filing cabinet. I propped open the doors of the filing cabinet with pieces of wood and positioned the fabric on the drawers. Next, I folded back half of the fabric and applied Mod Podge to that side of the drawer. For this step, I was sure to use plenty of Mod Podge to provide a strong and even seal of the fabric to the drawer. It is important not to let the Mod Podge dry before you adhere the fabric to it. In order to ensure that the Mod Podge did not dry, I worked on half of each drawer at a time. Here you can see how I folded back the fabric and how much Mod Podge I applied to part of this drawer. Once I applied the Mod Podge to half of the drawer, I folded back the fabric and pressed it firmly to the drawer. In order to avoid having bubbles in a Mod Podge project, it is important to completely and firmly smooth out the fabric during this step. The last step of the process was to apply the top coats of Mod Podge. I applied three thin and even coats to the top of the fabric to provide a strong seal and protective coating. For the sides, I wrapped the fabric around the drawer and followed the same steps – one coat under to glue it down and three coats over to protect it. When the last coat was dry, I was excited to see the finished product. I removed the wood from the drawers, flipped it upright, and wow! With a spruced up finished, I thought the filing cabinet needed prettier drawer pulls than the ones that came with it. I found these online and am waiting for them to arrive. I am so happy with how the filing cabinet turned out. The layers of Mod Podge make the fabric feel durable and protected. I actually look forward to filing papers now! ***Update, the handles have arrived! º How do you make organizing and filing fun? Clothing and decorating trends usually echo each other – whatever is hot in fashion, is hot in home décor. This year we have seen a return to the 80’s with neon colors leading the way. I’ve found some great neon pieces that you could easily add to your home. If chosen wisely, and mixed and matched appropriately, your neon accents would look chic for quite some time. One easy way to freshen a room is to change out the pillows. With their modern patterns and fun color combinations, these pillows would brighten any living room or bedroom. Ceramic animals are everywhere right now. Choose one or two of these brightly colored birds to add a fun pop on a bookshelf or mantel. Pick a piece of furniture – a coffee table, side tables, the back of bookshelves, etc. – and paint it to add a bright color in an unexpected way. These hot pink chairs would be adorable paired with a white tulip table in a breakfast nook. For a unique centerpiece that would coordinate with the white table and pink chairs in the breakfast nook, add a few DIY vases and fill them with beautiful blooms . Another DIY project is to take old frames and spray paint them whatever color you choose. They can be used to hold artwork or photos, or keep them empty and group them together to serve as the artwork. 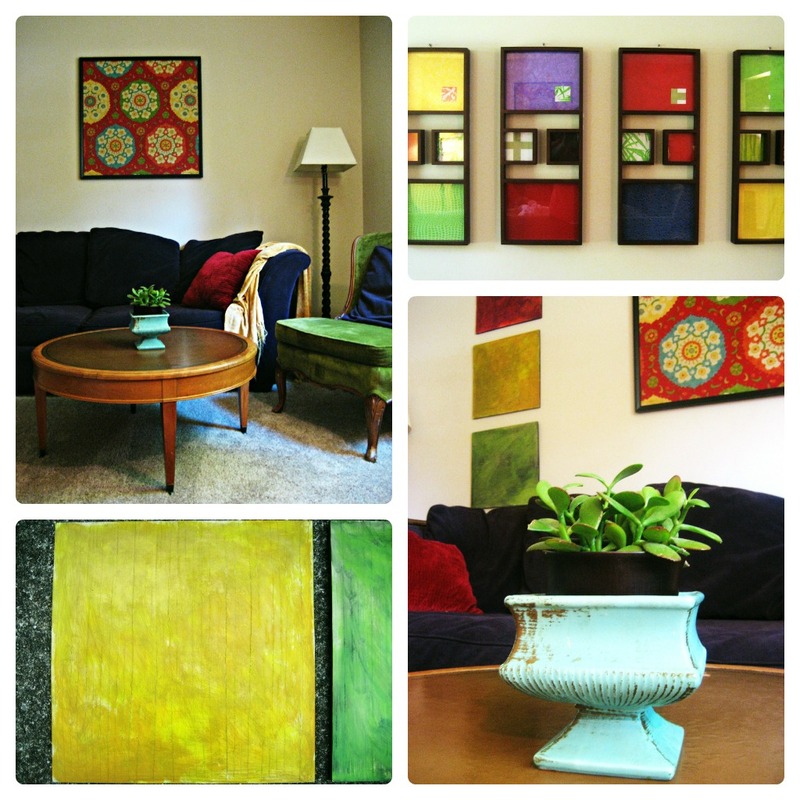 A brightly colored piece of artwork would surely be the centerpiece of any room. You can find neon art in any style - traditional, modern, abstract - and in any medium – photos, paintings, prints – so choose one that fits with the rest of your décor. Another way to bring the neon trend into your home is through an area rug. In both of these rooms, the rug adds a punch of color to the space. Alternating the floor tiles between bright and neutral colors allows you to switch out the bright ones when you are ready for a change. Moderation is the key! Find a few fun pieces that will coordinate with the rest of your home. Neon colors pair well with soft neutrals – greys and tans. They can also work with black and white. Depending on the space though, that could be too harsh of a contrast. Choose pieces that can easily be switched out when you are ready for a change. º Which neon piece is your favorite? º How would you bring neon into your home? They are not sold online however, and after calling several stores in the area with no luck finding either color, I was feeling discouraged. I decided I needed backup and sent an email to my mom and sister requesting a quick check for me any time they happened to be driving by a Target. Andrew and I picked them up this weekend, and went in search of the perfect color of spray paint. We eventually found exactly what we were looking for at Wal-Mart: Rust-Oleum’s ‘Nite Tide’. To start the project, I removed the lamp shades, covered the sockets for the light bulbs, and covered part of the cord. My plan was to: 1. Prime 2. Spray paint 3. Cover with a Lacquer for an extra-glossy finish. After two coats of primer, the lamps were already looking more modern. Once the primer was dry, I was ready to start adding the ‘Nite Tide’. The key to spray painting is to use several light and even coats. After three coats, the lamps were looking fantastic! I gave them a few hours to dry and then attempted to add the lacquer. I say ‘attempted’ because we did not have much luck with this step of the process. Once I had added two coats of the lacquer finish, the lamps were not glossy at all; in fact they were rough and looked dusty. I’m not sure if the Richmond humidity did not agree with the product, or if I had applied it incorrectly, either way, it was not a pretty appearance. We were lucky that with a wet washcloth, the rough and dusty finish wiped away – without taking away any of the color. Even without the extra-glossy finish, they are still beautiful, so we were ready to bring them inside. It really is amazing how different they look with a new paint color and an updated shade! Stay tuned for next week when I’ll share where we’ve put the lamps and other updates to the family room! º What pieces have found a new life in your home recently? With Easter just a few days away I’ve been feeling encouraged to do a spring craft project. While searching for inspiration, I found so many cute ideas. A mantel decorated with pastel colors, shimmery thread, and flowers is elegant and classy. Here is a mantel that uses natural elements and bright colors to create a shabby / chic feel. If you need a simple project, one that could be done with your children, check out this Easter egg garland made from paint chips. Any patterned or colorful paper would work for this project. If you’re looking for a unique centerpiece idea, use this tutorial to design your own custom vases. Mix and match colors and flowers to create the feel you desire. For my spring décor project, I decided we needed a door decoration for our front door. Since I made so many wreaths at Christmas time (here, here, & here), I went in search of other ways to embellish the front door. The first one I found was this umbrella overflowing with tulips and Easter eggs. While I loved both of these, I was worried about how wide they would be. We have a glass door in front of our main door, and I was not sure that something like one these would fit. I decided to make a trip to Michael’s to see what I could find. My plan was to create a ‘Welcome’ plaque for the front door. I have wanted to try Mod Podge, so I figured this was the perfect project to give it a shot. Mod Podge is a glue, sealer, and finish all in one product that allows you to create and decoupage crafty projects. Mod Podge can be used with paper, wood, fabric, furniture, and many other items. They even make a glow-in-the-dark Mod Podge! Check out Mod Podge Rocks for more details and inspiration. My first step was to paint the outer edge of the wood plaque. I did not want to try to wrap the paper over the lip of the plaque, so I decided to paint it a coordinating color. From there, I followed these instructions from An Altered Obsession for Mod Podging. Jenna is very thorough in her explanation, and she gives detailed step-by-step instructions and some very helpful tips. I love how it turned out and look forward to being ‘welcomed’ every time I come home! I've decided that Mod Podge is my new favorite crafting item, and I cannot believe that I’ve waited this long to discover it! I will certainly be using it for future projects. º What spring / Easter craft items have you created this year? º Have you Mod Podged? Andrew and I have been brainstorming about making over our family room and dining room for almost a year now. We are full of ideas, and have engaged in many conversations about what we want to keep and what we want to change. This weekend we made our first major purchase to start the process: a new couch! While we wait for the new couch to arrive, we are going to start working on the dining room. Our first step is to repaint the walls. Right now, our walls are a sage green color, with tone on tone stripes above the chair rail. We’ve enjoyed the stripes, but want to go with something a little more dramatic. For color inspiration, we turned to this chair that is in our family room (which adjoins the dining room). 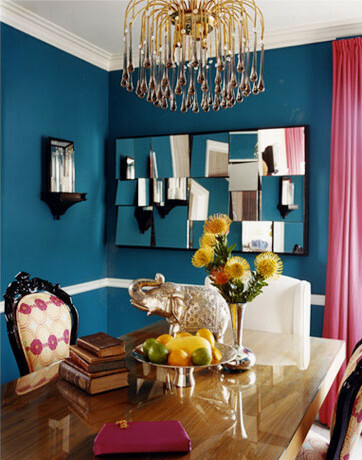 To achieve the dramatic effect we want, we are going to use the peacock blue color that is in the fabric on the dining room walls. I found a few inspiration photos of rooms that use a similar color, to give us an idea of the end result. In our dining room we have a chair rail, so we’re planning on using a dark, rich peacock blue below the chair rail, and a lighter blue above it. To add even more drama and impact, we are also planning on doing a stencil above the chair rail. My inspiration for the stencil came a few weeks ago, after helping my sister stencil her downstairs hall bathroom. She chose a Moroccan stencil for a feature wall, and the result was stunning! And here is her bathroom after the stencil! When you open the door to the bathroom, you feel like you've stepped inside a beautiful jewel box. I just love the shimmer of the pearl stencil color, and how it makes a statement without being overpowering. Both stencils are from Royal Design Studio. Stencil #1 is the Chez Ali stencil (and we would only use 2 colors instead of 4), and stencil #2 is the Small Acanthus Trellis stencil. We are excited and anxious to get started! I’ll keep you updated as we make progress. º Which stencil do you prefer ~ #1 or #2? º What makeover projects are you starting this spring? My sister, Beth, found this unique chair at an antique store in Clarksville, VA for $95. She immediately called me and asked me if I thought we could give it a makeover. I could see from the picture she sent me that the chair had great character and that the wood was in good shape. Her main concern was the fabric – a little worn out and not very exciting. She planned to put it in their bedroom, so we found the perfect fabric to match their colors: a quatrefoil design in sage and cream (from Williams & Sherrill). Over the holidays, we were finally able to find time to work on the redo together. We started with the back rest of the chair. It had an old trim that we easily ripped off. From there, we had to remove about 30-40 nails that were (very securely!) keeping the fabric in place. For this step, we used a flat head screwdriver to pry underneath each nail. We weren’t exactly sure how we were going to reattach the new fabric to the back of the chair, so we decided to take some time and think about it while turning our attention to the seat of the chair. The seat itself needed a little support, so we asked my husband, Andrew, to cut a few boards to attach underneath. We used the seat as a pattern for the new fabric and cut around it, leaving a few extra inches on each side. We decided the old seat fabric didn’t need to be removed, so we simply nailed the new fabric over the old, using ½” wire nails. We made sure to line up the pattern in the middle of the seat, and we pulled each side taut as we were nailing. Once the seat was complete, we returned to the back rest. We first used the old piece of fabric to make a pattern with the new fabric, leaving a few extra inches on each side. We decided to use the original filling from the chair, but we added a new piece of batting for an extra layer. After discussing whether nails or staples would be better for this step, we found the staple gun to be the easier method. First, we stapled the batting over the filling to the back rest of the chair. Once the batting was secure, we started stapling the fabric. For this step, we lined up the fabric and made sure to keep it tight and even throughout the process. When the fabric was stapled all the way around, we were able to slip scissors into the groove of the chair and trim the fabric to the exact size. The last step was to add a piece of trim in order to hide the staples. We found the perfect trim at U-Fab and used a hot glue gun to attach it to the chair. It was finally finished and ready for its new home! Beth and I had a great time working on this project together! The modern fabric ties in with their other décor, while the antique details of the chair add an unexpected touch to the room. She even had enough fabric left over for her mother-in-law to make a few pillows for their bed. Pin It º What have you reupholstered lately? º Have you ever stumbled upon any great antique store finds?